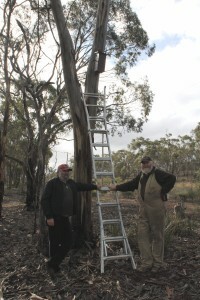 The Wedderburn Men’s Shed have been busy mounting nest boxes for the Landcare Network. 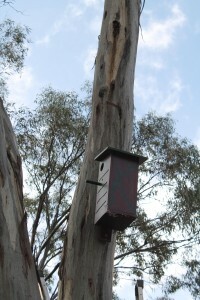 Several sites around Wedderburn will house the nest boxes which include parrot, treecreeper, possum, owlet and kookaburra nest boxes amongst others. 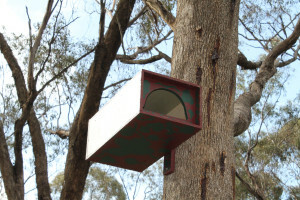 The nest boxes below are located behind the Wedderburn College and were painted by Grades 3 – 6 students from the school as part of the Network’s Nestboxes for Kids Program, which was funded by a Loddon Shire Community Grant. The nest boxes project has been part of the Year 9 Duke of Edinburgh Student’s classes for the past few months. They will be monitored for faunal activity and it is hoped they can be a part of the schools curriculum in the years to come. 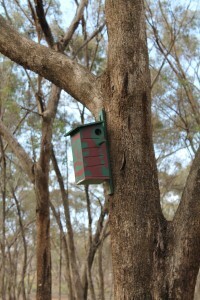 Photos: Nest boxes of various sorts. 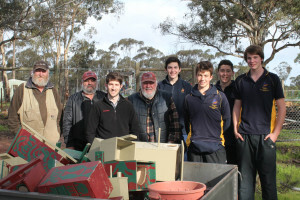 Men’s Shed members mount the nest boxes and are joined by Year 9 Duke of Edinburgh students from the school who helped transport the nest boxes through the bush.